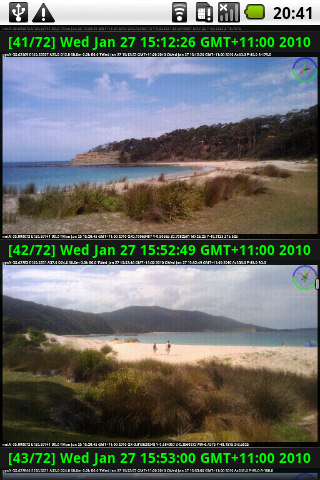 Image view shows imageotag thumbnail images in vertical scrolling lists. 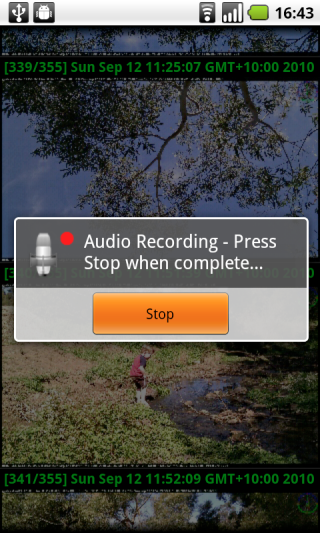 Pressing a thumbnail in the list will play the recorded audio clip for the image, long pressing a thumbnail will show the image in the Android image viewer. Pressing a thumbnail in the Image sequence view will show the images from the selected sequence in a sub list. Image view menu has a two types of options, those that show different image views and those used on individual images. 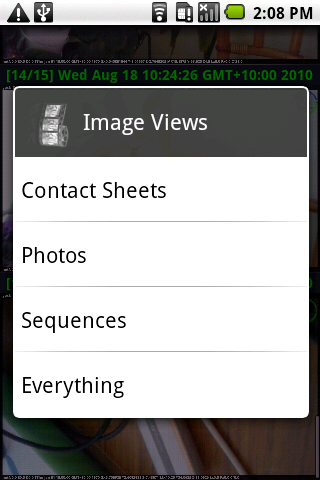 * Image view sub menu with selections for a contact sheet, photo list, sequence list and everything views. 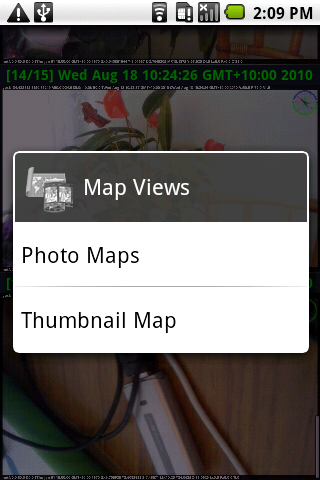 * Map view sub menu selections for photo map and map thumbnail views. Contact sheets contain thumbnail images with 24 and 25 images per sheet. Touching a sheet will show the list of images from the sheet. Contact Sheets Menu contains options to rebuild the contact sheets, useful when sometimes there is blank thumbnails in the Contact Sheets. 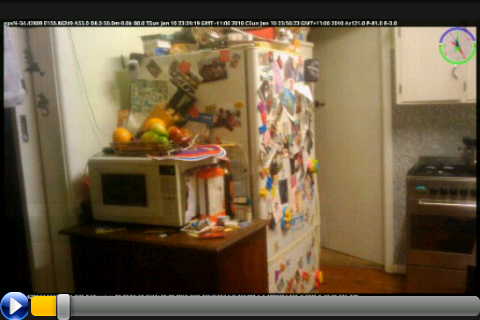 Map view shows the images from the Contact Sheet on a google map. Slide show shows the images from the Contact Sheet in a slide show. Slide Show presents a series of images with lap dissolve or zoom dissolve transitions. 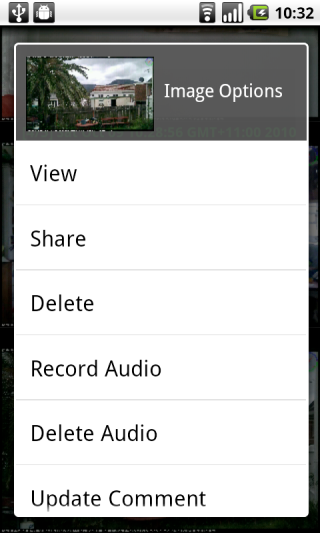 Audio is played for each image when recorded. 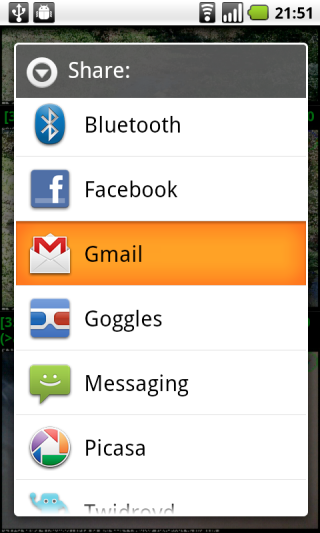 Transition type can be changed from the Settings activity screen. A slider is provided at bottom of the screen to allow moving within the series of images. A play and pause button allows the slide show to be started and paused. 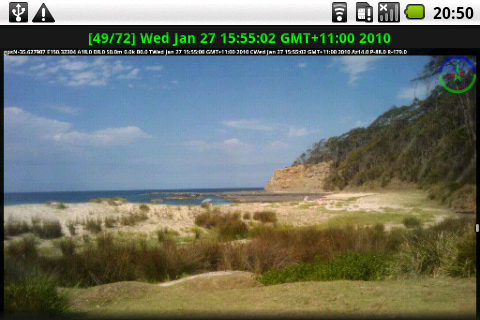 When paused swiping the touch screen will move to the next or previous image in the series. 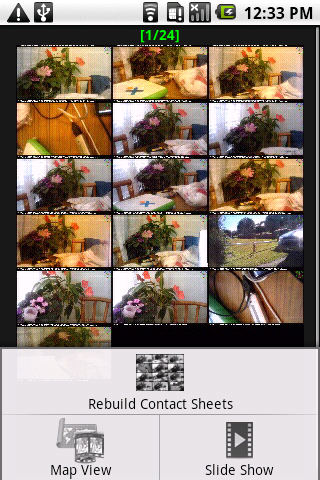 * Share a selected image via email, picasa, twitter and other device supported intents. * Record audio clip for the selected image. 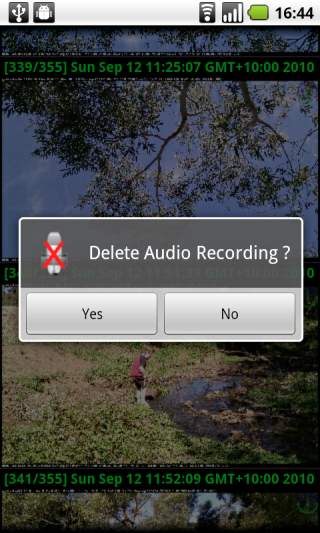 * Delete audio clip for the selected image. * Create a Google Earth Tour from the images in a list. Usually from image sequence lists. * Add or update the image comment text. * Scroll to top of current list. * Scroll to bottom of current list. Note that each of these menu options requires that an image from the list be selected and highlighted using the trackball or DPad buttons before choosing the desired option. Version 1.0.4 Update now provides an Image Options dialog, to support devices without a trackball or D-Pad. Long press on an image from the Image List and select the desired option. Update Image Comment is used to add or change the image comment text that is show on the right hand border of Imageotag images.